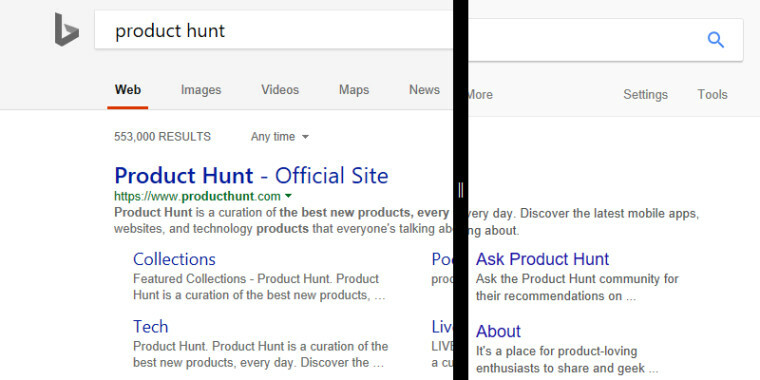 As spotted by the folks over at MSPoweruser, Microsoft may be considering a tweak to the design of Bing, specifically the look of the search results page, with many elements taking inspiration from the current design of Google Search. While the page showing search results is usually very sparse in terms of design and does not feature many elements, as the helpful comparisons between the UI being tested and Google's current design show, there are some interesting similarities between the two in terms of the header section, which displays your search query and some of the search options and filters that help sort the results according to your preference. The background for the header in the new design is gray, the search bar gains a slight shadow and the magnifier icon now has a white background, instead of the usual block of blue. These three changes come together to make the Bing header almost identical to Google's, with the exception of the names of the different tabs and the orientation of the magnifier icon. This new UI is only being tested by the company rather sparsely at the moment. Microsoft tends to do these types of tests often, so whether the company actually decides to change the design of its search engine is still very much in the air, though its relative lack of popularity compared to Google Search may explain Microsoft's desire to more closely mimic the market leader.